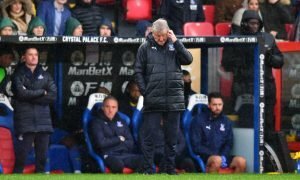 Roy Hodgson targets McCleary with Forest in financial trouble | The Transfer Tavern | Where football transfer rumours fly or die! Roy Hodgson is planning to capitalise on the financial situation at Nottingham Forest, by signing winger Garath McCleary. McCleary, who has only recently cemented a place in the Forest first team, is out of contract in the summer and is unlikely to be offered a new deal with the club in financial crisis. Forest can’t commit to offering any of their players new contracts at the moment, and the Sun reports that West Brom are also looking at defenders Chris Gunter and Luke Chambers. The Nottingham side also have an important relegation battle to contend with. Despite winning their last game against Coventry City, Forest sit in 21st place, just three points above the relegation zone. If they were to be relegated there is a very real danger that their financial problems will cause a crippling free-fall, similar to that of Leeds United, Southampton or Charlton Athletic. It has taken years for these teams to recover and turn their fortunes around. A lot of teams will be sniffing around the City Ground ready to offer reduced amounts for some of Forest’s talented players. In my opinion Hodgson shouldn’t pay much attention to Gunter or Chambers. The former has been given a Premier League chance before and didn’t overly impress, while Chambers has spent most of his career in the lower leagues and can’t be seen as anything more than a back-up player for West Brom. McCleary represents a more interesting proposition. Having worked his way up from non-league football, the 24-year-old was initially used as a substitute for Forest. Since Steve Cotterill took over though, he has become an integral part of the team and given the chance, it could be interesting to see if he can make another step up the football ladder.